Phethiwe Matutu grew up in a small village called Mqanduli in the former Transkei and is one of nine children of trader parents. Today she is one of the country’s pioneering scientists, with a Doctorate in Mathematics among her qualifications. She attributes much of her success to her father who insisted that all his children first study towards a B.Sc before any other degree. “We became nurses, designers, teachers and architects – and all of us have a basic grounding in science,” said Matutu, who is Chief Director for human capital and science promotion in the Department of Science and Technology. Her responsibilities include contributing to human capital development in the area of research development, with a special focus on postgraduate students and researchers. She also manages interventions to advance science awareness and engagement in South Africa. Matutu was bitten by the mathematics bug at a young age. “When I was at primary school, we had a very good teacher who instilled in me a love for mathematics. I was attracted to it because it is a challenging subject which requires a certain level of focus, skill and discipline. It always keeps you on your toes and tests your patience enormously. This resonated with me because I was never bored in that kind of environment. When she wanted to do her honour’s degree, she got an offer to study fulltime at Rhodes University, all expenses paid. “The rest is history. I did my honours, got a distinction in my masters and then decided that I wanted to teach. I received an offer to teach at the University of Cape Town, simaltaneously doing my PhD in Mathematics. Matutu said she had dedicated her entire career to developing human resources. “When we started this journey in the early 1990s, we had to penetrate the research-intense universities which were largely closed to black people. Earlier on in the 80s, one had to get permits to enrol for qualifications which were not offered anywhere else. The first thing that happened when we got there was to try to get as many undergraduate students as possible. “We realised that there would be issues related to culture, language, workload and bridging the types of education. We had to deal with the effects of Bantu education and there were a lot of foundation programmes in different universities. “When I joined UCT, the intention of the head of department was to use me as a role model for students who were getting into the foundation programme. In time these universities were able to attract black students at undergraduate levels, particularly in scarce skills areas such as science and engineering. There was resistance from black students because they felt they were being put in the foundation programme regardless of their capacity. “It was only later on when I started teaching at Stellenbosch University that we started to see white students in the academic development programme. The feeling that blacks were being stigmatised then started to wear off. “We are past that and now we are looking at researchers – looking at the demographics – and we are battling. As a researcher, I began publishing my work and was able to move from being a research fellow, to a lecturer and then senior lecturer. In order to do so you have to publish and at the same time be a solid academic in terms of teaching. “But as a black academic you get pulled in all directions. Everybody wants to use you because you are black, you are a woman and also you are showing certain levels of capability. “At the Department of Science and Technology, we have decided in our human capital development strategy to stratify the levels of development into the postgraduate level – which we call the next generation. “We have the emerging researchers which are largely young academics who are not internationally recognised. Then we have the established researchers. Since occupying this position I’ve had to focus on what is going on within the next generation and emerging researcher categories because we have to develop black researchers/academics. We seem to be succeeding in developing white women academics and researchers but we still have to implement interventions to get more black women into that space. Matutu said she never felt that she had to perform harder than others as a mathematician. “I was at white universities, which are research-intensive. In my view, within the field of mathematics, it is not easy to find young people who are focused on research and who are prepared to stay in the country. I found it challenging to be an academic at these universities. It was intensive in terms of the amount of time that you invest – 14- to 16-hour days to cope with the workload. That is standard for everybody. Matutu encourages an open mind about issues of transformation. “Transformation in South Africa in general is a two-way stream and the kind of support that you get usually comes from the people that you least expect it from. It requires a certain level of open-mindedness about the kind of opportunities that are out there. “For instance, the support that I received in all the institutions that I have worked at was wonderful. We need to be open-minded about how people think and what they can offer and take the opportunities which are provided to us and ensure that we are able to perform and create a history for our own children and for those who will come after us. “At all the institutions that I have been to everyone knows, based on my performance, that there is nothing blacks or women cannot do. Every black person is capable of delivering in the same way that everybody else is able to deliver. There is a certain level of openness, which is required. “There is a reality that needs to be faced: there are people who have racist tendencies and the way that we deal with those people is not by running away. It’s by confronting the problem of racism head on. I cannot lie and say that along my journey I didn’t encounter racism. I encountered it on numerous occasions. There was a time at Stellenbosch when the Dean did not want to make me permanent because I was not conversant in Afrikaans. With the support of senior Professors in my Department we were able to win that battle. “This was after I had a publication within a short space of time and completed my PhD. There are times when you really have to be confrontational, state your case and be clear about what you are prepared to accept. Then you can come to an agreement. They made me permanent and that was that. It requires a certain level of honesty about your situation and being forthright. There are careers which really test one’s patience, regardless of whether you are black or white. These are good for certain types of people and not for others. “A researcher’s career is one of those which is really testing in that recognition by your peers and upward mobility usually takes time. If you are the kind of a person who is patient, loves flexibility, enjoys intellectual engagement, international travel, constantly being in a pressured environment, whether you are white or black, that is the career a researcher has. Matutu said that she has had more opportunities in South Africa than sacrifices she has had to make. “Going to various institutions I benefited from government funding, through bursaries, funding subsidies and employment. However, in order for me to to take these opportunities, there are a lot of sacrifices that my parents had to make. “I could not contribute to my family until my late 20s and that was a sacrifice because my parents had to look after my first-born child. They were open to that and they were able to do so. Now my husband is the Principal of Rhodes University and I live in Pretoria. He lives in Grahamstown with the children. In order for me to be able to contribute right now in my current position he has to look after our children. They are in a hostel and that is a sacrifice. “I left my children while they were fairly young and I go there once every three weeks or so. These are the kinds of sacrifices that I had to make, but when I think about those women who marched to the Union Building on our behalf, it seems like such a luxury for people like ourselves, with the kind of opportunities that we’ve been presented with, not to chart the way forward, not to contribute by making this path much easier for those who will follow. Matutu said science was very important for the economy. “At the end of the day you need to be able to produce people who are creative, inventive and can think out the box. People who can use their knowledge for the benefit of the rest of society. Our mineral resources are not unlimited. How do we use our knowledge to convert them into products and processes, which create economic benefits for our people? Matutu said there has been a decline in learners completing grade 12 with maths and science in the past few years. “When Minister Pandor was still Minister of Education, she made mathematics compulsory for all learners. She said that no learner should leave Grade 12 without any form of mathematics. You could do pure maths or maths literacy. The numbers seemed to be increasing for mathematics but somehow there has been a decline lately; at the Department of Science and Technology we are now doing mathematics awareness as part ofScience Promotion initiatives. “We have a number of campaigns. There’s the National Science Week, where we reach out to the public of South Africa. A huge component of this is aimed at learners where we really preach the importance of science in our day-to-day activities. We also have a career booklet which gets distributed to a number of schools. More than 15 000 copies are distributed per annum. “We have a role-modelling campaign where post graduate students and scientists talk to different stakeholders, particularly learners. We have science festivals, such as the Grahamstown Science Festival – Scifest Africa, the biggest science festival in Africa. At the school level we have the mathematics and science Olympiads which highlight the importance of science subjects to the learners. 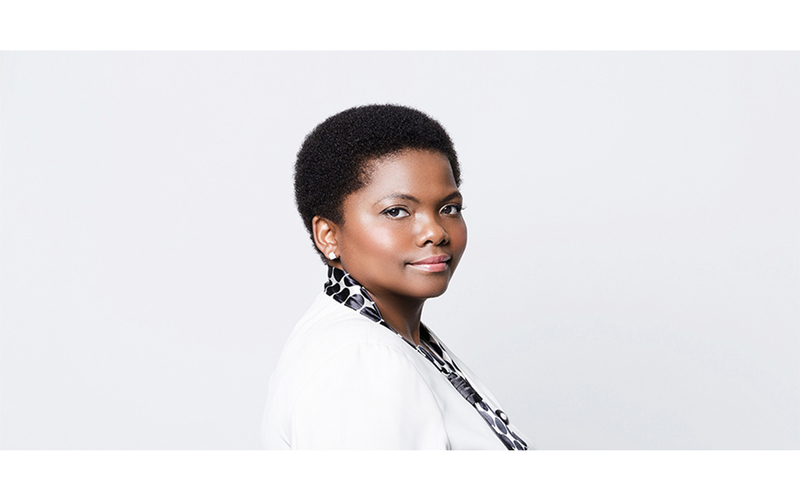 Matutu herself is an inspirational role model who is making a vital contribution to changing the demographics of post graduate students in South Africa.